Before we begin, preheat your oven to 320 degrees F (160 C), because in under 5 minutes your vegan drop biscuits will be ready to bake. No need to knead, or let them rest. They’re hassle free, time saving delights that are healthy, nutritious, and always come to my rescue when I’m out of bread, or just craving something freshly baked. 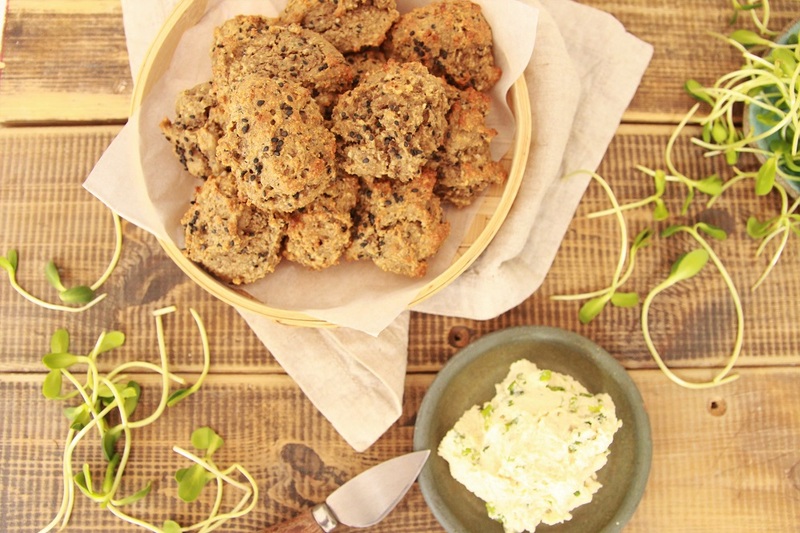 They are filled with nutritious ingredients like black sesame seeds, that are extremely healthy. Check out the many health benefits of black sesame seeds here. Plus, they’re packed with ground flax seeds. Here’s an excellent post that tells you everything you need to know about flax seed and all its amazing health benefits. But getting back to these savory biscuits, they have been my go to recipe lately! 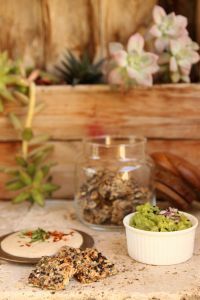 Served with a super simple spring onion and garlic cashew cream, these scrumptious delights go great with anything. It’s all about multitasking. While your oven is preheating, place all the dry ingredients in one bowl, and all the wet ingredients in another bowl. Next, give them both a good mix, then when your oven is ready, place the dry ingredients in with the wet and mix until combined. Scoop 12 balls with a tablespoon onto a baking tray lined with baking paper, garnish with a bit of black sesame seeds, and pop them into the oven for 8 – 10 minutes. Every oven is different, so bake until they start to lightly brown. When ready, take them out to slightly cool. Soak the cashews in hot water for a couple of hours, or overnight, then rinse them well and blend along with the peeled garlic clove, lemon juice, and a pinch of sea salt. Transfer your cream into a bowl, then finely chop the spring onion, add it to the bowl, and give it a quick mix. Finally, spread some of that creamy goodness on top of your vegan drop biscuit, and Bon Appetite! How did your savory biscuits turn out? Do you agree they’re a HUGE time saver? I’ve put together a few recipes that I think you might like. 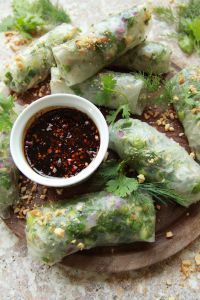 Vegan Summer Rolls for those HOT days. 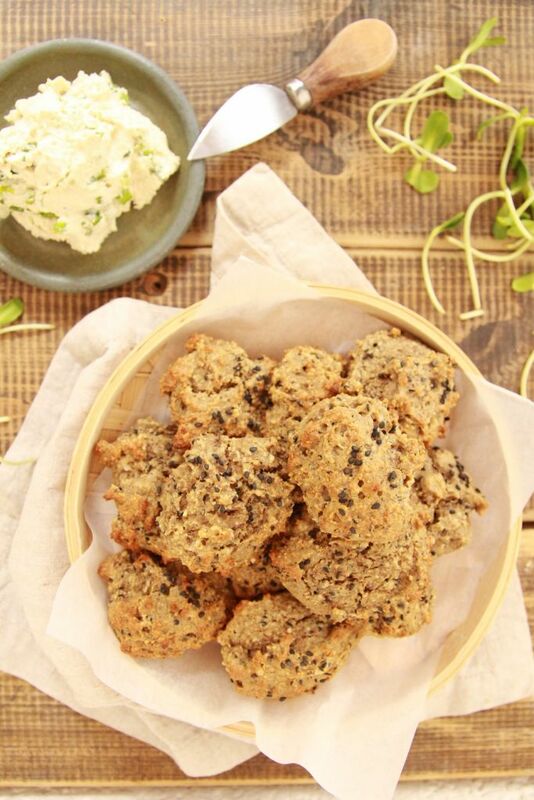 Vegan Seed Crackers to dip into your spring onion and garlic cashew cream. And of course, something for that sweet tooth you might have. 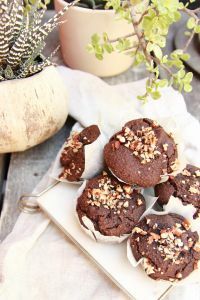 Chocolate Muffins! ← Hearty Vegan Mushroom Pastry – With Chestnuts! I made these tonight for dinner with a few changes. I substituted buckwheat and chickpea flour for the almond and rye, canned pumpkin for the applesauce and apple cider vinegar for the lemon juice. I added coconut oil(about 1/4 cup) instead of the almond butter. I omitted the maple syrup and sesame seeds. I didn’t make the cream to go with it. Next time I may add some nutritional yeast and sage, thyme and fennel. Thanks for the recipe! !